Pub discussions since pubs began have always thrown up interesting, if pointless and inebriated, debate, not least this one - 'who is/was the greatest rock drummer of all time?'. Before you stick your hand up and nominate the sticksman from Snow Patrol, The Script or Green Day, consider this - Led Zeppelin's John Bonham really was a truly great drummer. Listen to any one of Zep's albums for proof. End of discussion. Mine's a pint. After debating best drummers, greatest rock bands then invariably come under the microscope and the precursor to last orders. Not surprisingly, Led Zeppelin quite rightly reign supreme within the same echelons as Queen, Deep Purple and Black Sabbath - huge rock bands with more than just music to back them up. Messrs Plant, Page, Jones and Bonham remain among the greats of musical innovation and theatre - and they're British. Hoist up the flags. And despite splitting in 1980, soon after Bonham's untimely death, Led Zep still hold sway among rock, metal and any other music fan across the globe. With Jason Bonham sitting in his father's seat, Led Zeppelin's original members regrouped in 2007 for a one-off concert at London's O2 Arena. The benefit concert for their old label Atlantic Records founder Ahmet Ertegün, was recorded for posterity and has remained in the vaults - until now. 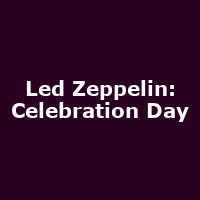 Featuring the full O2 concert, along with extra clips and rehearsal montages, the Celebration Day film will be premiered in London on Friday 12th October 2012 - and we have tickets available right now! Prices start at £20 which gets you the film and an exclusive appearance from Robert Plant, Jimmy Page and John Paul Jones, a real treat for Zep fans. On Wednesday 17th October 2012, cinemas and theatres across the UK will screen Celebration to a wider public - tickets are also available now (some cinemas will offer two screenings) but, again, these will sell out very quickly. A full DVD release is earmarked for the run up to Christmas - put me down for one.